I am not good at picking favorites and I am especially not good at picking favorite books. There are so many variables. New book or reread? Fun fluff or deep and meaningful? Fiction or nonfiction? I frequently sink into a morass of confusion and eventually give up. But this time I am persevering and giving you a slightly arbitrary selection of my best reads of 2016. Really, it is absolutely amazing that I kept track of what I read this year. I have only done this for a few years in my whole life. I am not sure how I feel about keeping track of my reading. On the one hand, I like having a list of what I read during the year. On the other hand, it is easy to get caught up in how many books you have read and those reading challenges don't help. A Dickens novel is going to take much longer than three Georgette Heyer novels read in a row (yes, I did both this year) but the Dickens novel only counts as one book. I have decided that for 2017 I am going to make a simple list and ignore the numbers. There are a few things you need to know about this list. There are no rereads on it. That rule was made out of pure self-preservation. I reread a lot of old favorites this year and if I had to put them on the list I would be writing this post till doomsday. Which reminds me, I reread Doomsday Book by Connie Willis this year. So good. Go read it if you haven't yet. That isn't on the list, it is a bonus recommendation. Also, you should be aware that there are not reviews for all these books on my blog. I talk about books pretty much constantly but I don't post a review for everything I read. I guess you would say this is a book love blog instead of a book review blog. Finally, this list is in no particular order. I started this year by reading Bleak House by Charles Dicken. Dickens was an immensely popular novelist for a reason. I hadn't read Dickens in years and I had forgotten just how immersed in his world it is possible to become. I swore I would be reading more Dickens this year and it didn't happen. His books are perfect middle of winter reads so maybe in January I will pick up another one. Read my review of Bleak House here. This was also the year in which I was introduced to the Lymond Chronicles. I read the whole series but they are only counting as one spot on my list. Set in Scotland during the 1500s they follow the fortunes of Francis Crawford of Lymond, a "scapegrace nobleman of crooked felicities and murderous talents, possessed of a scholar's erudition and a tongue as wicked as a rapier." How can you possibly resist that description? The Makioka Sisters by Junichiro Tanizaki was recommended to me by A Reader of Literature. It follows the lives of four sisters in Japan in the years just before WWII. It was fascinating to get a look into a world so different from my own. It is a quietly written and subtle book. I thoroughly enjoyed it. Read my review here. I reread Mansfield Park and Pride and Prejudice this year but they aren't allowed on this list because I have read both about five million times. However, I am still managing to slip some Jane Austen in with my next two selections. 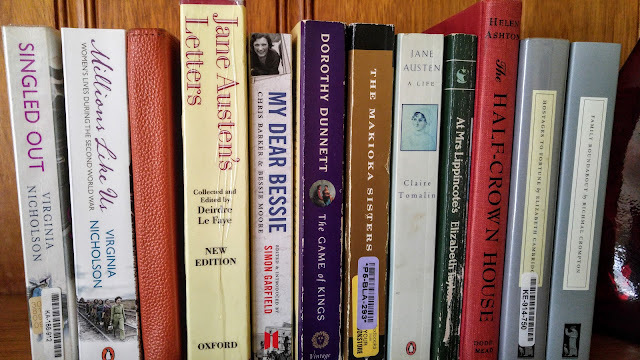 Jane Austen--A Life by Claire Tomalin is a fascinating depiction of the woman who wrote some of the absolutely best books in the world (not an exaggeration.) I also read Jane Austen's Letters edited by Deirdre Le Faye. I heartily recommend both books. They bring Jane Austen to life as a real person and not just the myth and legend she has become. I read two nonfiction books by Juliet Nicholson. Singled Out is the account of "how two million women survived without men after the first world war." Millions Like Us is a detailed and fascinating depiction of women's lives during WWII. If you enjoy social history and reading about the time period around either of the wars then these are the books for you. I found them both to be absorbing. Elizabeth Taylor is such a nuanced writer. I have enjoyed all the books I have read by her and I am working my way through her books very slowly because I will be sad when I run out of them. I read At Mrs Lippincote's this year and loved it. Julia and her husband Roddy, who is in the RAF, rent Mrs Lippincote's home for a time during WWII. It is not really a war book but instead is more about relationships. Elizabeth Taylor always seems to write more under the surface than above which is why I enjoy her. The Half-Crown House by Helen Ashton is the story of an English country house, and the family that lives in it, over the course of one day. It is a quiet book but I enjoy that. It has a lot to say about the changes to society and the big country houses after WWII ended. It was an interesting insight into a world that was disappearing. My Dear Bessie--A Love Story In Letters edited by Simon Garfield was emotional and touching. It is a compilation of the real life letters written by Chris Barker and Bessie Moore while they were apart during WWII. I highly recommend it. I read several Persephone Books this year which is always a guarantee of wonderful books. Two of them made my list of best books. Family Roundabout by Richmal Crompton is a enthralling depiction of two families and their interactions over the years. Read my review here. I also loved Hostages to Fortune by Elizabeth Cambridge. It is about the "day-to-day life of a middle-class English family, living in narrow circumstances in an Oxfordshire village." Really though, it is about so much more: about family and marriage and children and ambitions and relationships. I want to read it all over again now. Tell me, what were your best books of 2016? Your list speaks a lot with me. In 2017 I really want to read "At Mrs Lippincote's". I tried to read "Bleak House" last year, but I feel so far from the victorian writers (perhaps one day I´ll find the key to them... but I love "Wuthering Heights"!). And Jane Austen is God, yes. I´m a Persephone enthusiast and I´ll keep those titles in mind. It does sound like we have a lot of book interests in common. I have read Someone at a Distance and Little Boy Lost. Persephone books are so dependably good, aren't they? Dickens can seem like a lot to take on but he is quite readable once you really get into the story. I think I am going to start the year with another of his novels. I'll have to look up your other best books. I am not familiar with all of them. I think I am going to start the year with another Dickens. I just haven't decided which one yet. I read them all years and years ago but barely remember them so it is like reading them for the first time. Merry Christmas, Jennifer! Hope you enjoy the rest of the holiday season and that 2017 will be an even better year! I was so pleased to see The Makioka Sisters on this list. Believe it or not, I forgot that I suggested the novel for you; I feel like it has been so long since you asked for Asian book recommendations. Speaking of forgetfulness, I read Angel, my first Elizabeth Taylor, two years ago and absolutely adored it. It was one of my favorite books of 2014. Why I’ve never picked up another Taylor since then is truly a mystery. I’m leaning towards ordering “Mrs Palfrey at the Claremont” in the new year thanks to bookssnob’s glowing review. On Dec 16 my father sent me a Daily Telegraph spotlight on Austen since that was her birthdate. I responded with a long, detailed, and geekily excited reply on how Austen is the most iconic British female author. No, scratch that, I’m willing to argue that Austen is the most iconic female author full stop. My poor dad isn’t a book person at all, so next time I’ll try to contain my enthusiasm for dear Jane. I plan to write my own “2016 Favorite Books” post… eventually. Hahaha, as everyone who has crossed paths with me on the book blogosphere knows, I am painfully slow and sporadic at updating. It's good to hear from you again. I read Mrs Palfrey at the Claremont this year. I greatly enjoyed it and it almost made it onto my list. There were so many good books this year. I didn't see the Daily Telegraph spotlight but I am sure I would have totally agreed with your "geekily exited reply." Because yes, Austen is the most iconic female author. Containing enthusiasm for Austen is never necessary when you are talking to me! I look forward to reading your favorite book post when you have time to write it. I know your life has been very busy lately. I hope next year treats you well. It's so hard to pick favorites! I don't think that I can. But a few books I loved this year were Homegoing by Yaa Gyasi, The Girls by Emma Cline, The Circle by Dave Eggers, Lexicon by Max Marry, and Feed by MT Anderson. I never used to keep track of the books I read but a few years ago I started doing the Goodreads reading challenge. I like being able to keep track of the books I read but I do feel pressure to read shorter books to get to my challenge. This year I'm setting a smaller goal so I can tackle the harder books I've been procrastinating. I remember reading about Homegoing on your blog and thinking it sounded interesting. I will have to read it soon. The Girls has been on several "best of" lists I have read recently. I'll have to look up the others. I am not familiar with them. I agree that I am going to try to not worry about numbers of books and instead read what I want or feel challenged by. I can get too caught up in the numbers. Thanks. It was a good reading year. I had to leave some very good books off the list or it would have been ridiculously long.